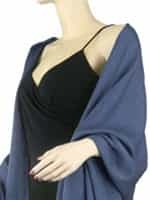 For ultimate luxury and warmth, wrap yourself in a pure cashmere pashmina shawl, wrap or scarf. They're 100% cashmere bliss! A "ply" represents the thickness of the yarn used in the weave, so a 3 Ply has more cashmere than a 2 Ply. 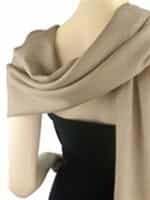 The Pashmina Store in pleased to offer you a choice of Ring style, 2 Ply and 3 Ply pure pashmina items. Which one should you chose? You actually can not go wrong with any of them! A light-as-a-feather Ring style is comfortable for wear year-round and for anytime you want to carry a fashionable wrap that takes up a very small amount of space when folded. Regular 2 Ply items are a bit heavier than the Ring style so they are still excellent for all seasons, for warmer climates and persons who may need a bit more warmth than a Ring style but not as much as the 3 Ply. Our most popular, the 3 Ply, is the most substantial (without being bulky), offers the most warmth and is wonderful for cooler weather and for any person who tends to be cold-natured. They all represent a great pure pashmina value. The Pashmina Store is proud to bring you premium, 100% pure pashmina accessories. 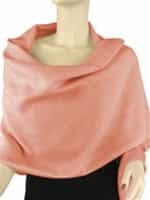 Our pashmina shawls, wraps and scarves will liven up your entire wardrobe and add warmth to your life. Order today and start enjoying your new pashmina fast! We usually ship the same day if you order by 3:00 PM central time. Standard shipping is free and faster shipping options are discounted.